To begin with, the apartment was beautiful and very comfortable with plenty of room to move about. The entrance is situated on Place Carnot and overlooks Rue Monge. The elevator was modern and made getting in and out of the building effortless. Free public parking can be found 5 minutes away either south or northwest of the apartment. Everything in Beaune is accessible since the apartment is in the center of town. Brigitte, our hostess,was wonderful. She warmly welcomed us with a bottle of wine and an assortment of local goodies. I will highly recommend this apartment to my friends and family and my wife and I will definitely stay here again in the future. 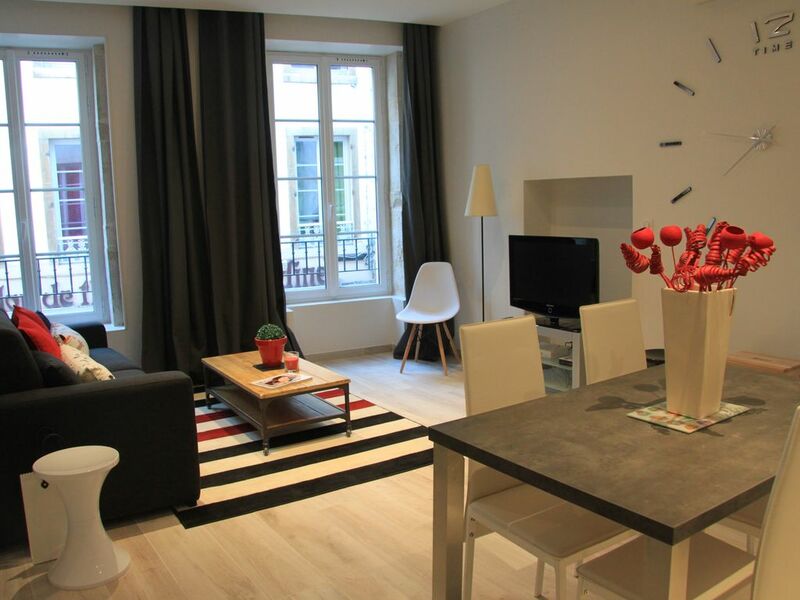 A lovely apartment, right in the middle of Beaune. Very well stocked, with plenty of everything that we needed (ie crockery, cutlery, cooking utensils) and even a bottle of wine in the fridge waiting for us. Our host, Brigitte, was very welcoming and ensured that we knew everything that we needed to about the town. Free short term parking adjacent to the apartment, and long term free parking less than 5 minutes walk away. It was very hot while we were in Beaune, and the air conditioning was very welcome. The apartment was ideally located in the center of Beaune. It was wonderfully furnished and the kitchen was well-stocked with cooking supplies and a lovely local wine. While we had to park on the outskirts of the old city, it was only a 2-4 minute walk to get to our apartment. Perfect Location for a Couple! We LOVED staying here! It was such a great spot, Brigitte was very sweet and even left us wine which was waiting for us when we checked in. It's right on the main part of town so we were able to walk everywhere and it's right by the little market that is set up on the weekends. It was equipped with everything we needed and very clean and comfortable. Would definitely come back and stay here again! Stayed for a short break and the end of April. The Apartment is first class and equipped with everything you would need for home comforts. The location is in the centre of town with all of the town's attractions within walking distance. If travelling by car there is a free car park within 5 minutes walk with short stay paying car parking at the door of the apartment. I would highly recommend this property for your stay in Beaune.